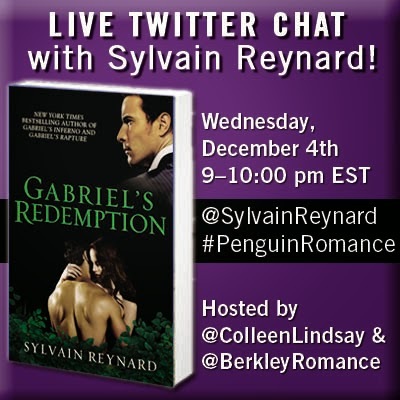 The third and final book in the Gabriel series by Sylvain Reynard releases tomorrow (December 3). Both Gabriel's Inferno and Gabriel's Rapture have appeared on the New York Times Bestseller List. However, SR has accomplished a feat not many authors have been able to in this age of digital information. E. L. James couldn't do it, nor could J.K. Rowling. What is this great accomplishment? SR has been able to maintain a modicum of privacy. Pen names are not uncommon, but it is rare that the true identity of the author is not revealed. Last year, I spoke with a reporter at MACLEAN'S, a Canadian publication, about whom Sylvain Reynard is. At that time, fans were still speculating whether the author was male or female. (The bio in Gabriel's Inferno contained no pronouns). Is the mystery part of the charm? In this day and age when everyone must know everything about anyone rich and famous, can Sylvain Reynard remain anonymous? As I told the reporter, I'm not one who enjoys Hollywood gossip, and I applaud SR's ability to maintain his anonymity. 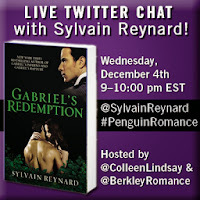 However, popularity does come at a price, and information of whom Sylvain Reynard is has leaked into the media. As it is Meet the Author Monday, I thought I would share the tidbits that can be found. Sylvian Reynard is the second known identity this author has assumed. SR first appeared in the writing world as Sebastien Robichaud, a member of the Twilight fanfiction community. Most writers there use a pen name. A majority of fanfiction writers are female. Furthermore, a majority of romance authors are female. So there was speculation that the author was truly female, but using a male pseudonym to further cloak the true identity. To help end the confusion of whether we should refer to SR as a he or she, SR self-identified as a male. He also claims to be Canadian. Dig any further into personal information and the interviewer is most likely to receive a "No comment". Yet, there is more to know about the public figure, and from that we may know who the author truly is. SR is a charitable soul. He often highlights charities through his social media. According to a May 27 blog post, he is partnering with Heather Huffman, author of Throwaway and who is a strong proponent of anti-slavery/human trafficking, to write a romantic comedy as a charity fundraiser. The fan group Argyle Empire has a listing of the many charities SR supports. SR is an inspiration to many. Through his endeavors to raise awareness of the needs of a hurting world, he has inspired others to get involved in their community. One organization that I've seen SR mention on a number of occasions is Covenant House. One fan shared with Argyle Empire her experience with volunteering at their local Covenant House. He has also sparked a level of interest in literature and culture among his fans that is probably not typical of most romance novels. You can find information on the art, music, and literature mentioned in the series on SR's website. SR is a nice guy. Perhaps it is because of his humble beginnings as a writer and the need to connect with people in order to convert them into fans. However, if he were not truly a caring person then it would be difficult to keep up the appearance. I have seen (and been the recipient) him personally tweet fans. He is always willing to help when he can. SR has a new project underway. Last week it was announced SR has a new series up his sleeve. Though no release date was provided, there is a brief description. The mention of priceless Botticelli illustrations at the Uffizi Gallery in the cover copy, and confirmation by SR, fans are assured that they will not be saying goodbye to the Professor when they turn the last page of Gabriel's Redemption. I love what you wrote about my favorite author, SR. I hope his desire for privacy will always be respected. I know I'm not alone when I say this, but I rather like the mystery about this remarkable man who has touched my heart and soul and inspired me in many ways. This mystery man is another story in itself. I pray he continues to entertain us for a long time with his brilliance. I think the mystery adds a bit too it. But at the same time he's so personable on social media that people feel like they know the true person even if they don't know his real name, residence, or occupation. I think that's why he's able to keep his private life private.